This vehicle was built for United Welsh in 1959 with ECW body, and it worked on routes in Gower. In 1969 when United Welsh merged with South Wales Transport it became 916, and in 1974 it was converted to a tree lopping vehicle. In 1991 it was acquired by the 447 Group and restored as an open topper, and registered as ACY 178A, then ACY 307A its original number having been transferred to a National Express coach. The registration number was later transferred back to this vehicle which was then bought by the SWT Group in 2010. 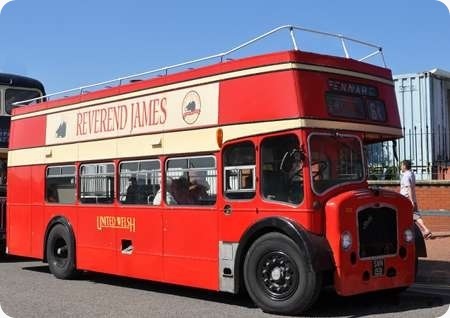 It is seen at the Barry Island event in June 2013 although it was not in service. In response to the subject of open toppers, here’s a very extreme one. Poor old once-proud Lodekka, subjected to such ignominy. I don’t know any history of this vehicle. Perhaps somebody can tell us more. I don’t know who took the photo either, it’s just a print that has been in my spares box for many years. An open-staircase, frilly-hatted Lodekka toastrack! Looks as though the platform’s been shortened by a foot or so, too. Must have knocked a few hundredweight off the UW. In a way I agree with David R that this LD has suffered ignominious treatment, but it’s all done with such style that I can forgive them! 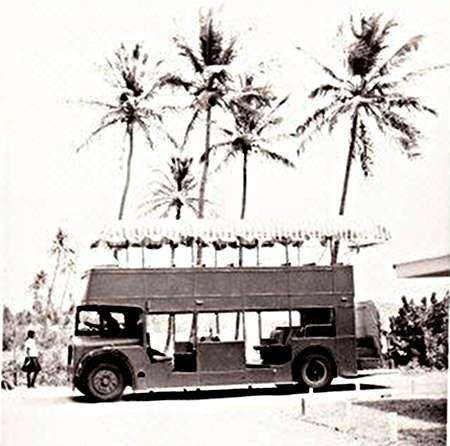 You get the impression that the toastrack is about to set out on a Kenyan safari. All very Colonial-looking!